If there is one attribute that is vital to the the diamond, it is the belief and confidence invested in it by consumers and thus through diffusion, the confidence that financial institutions repose in the diamond industry. This vital attribute is in great danger today. Much of this is because some unscrupulous players in the diamond industry have diverted much of their time and money to other enterprises — and have indulged in all sorts of unethical practices as well. All that is now catching up with the industry as evidenced by the string of bankruptcies among Indian diamond processing companies, including many large companies with valuations in hundreds of millions of dollars. Many claim that the industry’s ills are due to the mining companies and their “shortsighted” rough pricing policies. They claim that in order to satisfy their own investors, the miners have gone on increasing the price of rough diamonds, regardless of whether or not these prices translated into viable polished diamond prices. Cutting and polishing firms have, consequently been operating on wafer thin margins, many haven’t been able to make any profit at all, they add. While this is partly so, I don’t agree altogether. Much of this has to do with the cutting and polishing companies themselves and their own shortsighted business models. It starts with the long-term supply contracts that diamond cutting firms sign with mining companies. The idea of a long-term contract is to smooth out the wrinkles in the global market and keep an assured supply of rough diamonds coming to cutting shops at prices that should ideally only change via long, gentle curves, thus eliminating the price shocks that a marketplace can otherwise deliver. Long, smooth curves, however, aren’t supposed to only slope upwards. Sometimes, the consumer marketplace dictates that they slope downward too. But diamond cutting companies have been too busy cutting each others throats and have gone on buying rough at ever increasing prices, regardless of consumer demand. They have ensured that the price curves always slope upward. Companies have intentionally overpaid for rough and then sold the resulting polished at prices below even prevailing market rates just to show turnover. Their real intent was to divert substantial amounts of the bank credit to real estate, the stock market and a variety of other enterprises. These other enterprises gave them profitable returns then, thus enabling these companies to secure enhanced lines of credit from the banks. But this credit, at concessionary rates, was intended for the export production of diamonds. The ostensible reason for the credit was actually running up substantial losses. This has gone on for a significant amount of time and a staggeringly large amount of bank finance intended for diamond manufacturing wound up in real estate and the stock market. By staying in the market, buying rough at unrealistically high prices and selling the polished at laughably low prices — they didn’t really mind because they were earning elsewhere — these companies destroyed much of the market’s fundamentals. A direct result of this has been the complete erosion of workable profit margins for genuine diamond cutting and polishing. However, as these companies continued to buy large volumes of rough diamonds on an ongoing basis, the mining companies felt encouraged to go on increasing the price of rough diamonds. Here I must say that this doesn’t completely clear the mining companies of responsibility for the situation. Market feedback for some time now has clearly indicated that consumers weren’t willing to pay more for diamonds. But the miners chose to listen to their investors, who clamoured for ever more revenue, and have gone on raising rough prices. They haven’t been concerned with the health of the processing pipeline. With squeezed margins and precious few alternatives, many companies have also turned to the unethical practice of mixing undisclosed synthetic diamonds with parcels of natural goods. Synthetic diamond rough typically costs 30 percent less than corresponding natural rough. Undisclosed mixing thus has been the route these companies have chosen to try and get out of their unsustainable business models. There have also been significant increases in a variety of other undisclosed diamond treatments to enhance colour and clarity. This has had the most serious effect on the market in that when these undisclosed synthetics and treated stones have finally been discovered, consumers have lost confidence in diamonds as a whole. This loss of confidence comes at a time when the global consumer marketplace is being saturated with a variety of other products and luxury goods that are vying for the consumer’s disposable income. To put this in perspective, back in 2005, the world’s diamond mines collectively produced 175 million carats. This year’s total mine output is estimated at around 131.1 million carats. That’s 44 million carats less in the global marketplace today. But contrary to what standard theory predicts regarding shortfalls in supply, polished diamond prices have not gone up sharply. In fact, they’ve been going down. This year’s prices are already some 2 percent below last year’s prices — which themselves were between 2- and 5 percent below the previous year’s prices. The single biggest cause for this seeming anomaly is the lack of global promotions for diamonds. The global industry got a free ride on De Beers’ vaunted global promotional campaign for many decades. But that was when De Beers controlled more than 85 percent of the world’s diamonds. Today they are in the region of 35 percent and naturally don’t feel in the least obligated to carry the entire industry’s promotional burden. A diamond has no practical use and the only value it has derives from the consumer’s perception of it as being precious. Generic promotions are vital. The formation of the Diamond Producers’ Association (DPA) has been an encouraging start in this direction — though their collective budget of $6 million seems bizarre in light of the fact that De Beers alone spent some $200 million annually back in the day. Still, as I said, it is a step in the right direction. Now that the producers have got started, it is time for organisations like the World Federation of Diamond Bourses (WFDB), the various individual diamond bourses around the world and trade bodies like the Gem & Jewellery Export Promotion Council (GJEPC) in India, the Antwerp World Diamond Council (AWDC) in Antwerp, the Israel Diamond Industry (IDI) and the International Diamond Manufacturers’ Association (IDMA) to get involved with the issue of promotion and generate a realistic budgetary contribution. Meanwhile, the diamond processing companies who got the global diamond industry into a financial corner, are in trouble themselves now. Every market has its own ups and downs. The real estate and the stock markets are no exception to this rule. With both these sectors — as well as a number of other businesses that diamond companies secretly sank money into — have all been either stagnating or in retreat. And of course, these companies haven’t been making money cutting and polishing diamonds. The rash of bankruptcies among diamond processing companies today isn’t simply bad news for these companies and their creditors. It’s bad news for all of us. The banks don’t trust the industry any more, and today, even legitimate, well-run companies are being regarded with suspicion and are facing sharply tightened lines of credit. With eroded consumer confidence and now viewed with increasing suspicion by the financial institutions, the diamond industry is really in big trouble. The diamond industry’s banking debt at the end of the last fiscal year was estimated at $15.5 billion. Of this, 40 percent was in India, 24 percent in Belgium and 9 percent in New York and 8 percent each in Israel, Hong Kong and Dubai, with the remainder elsewhere. The consequences of financial failure will be severe. The key point is, however, that this isn’t going to end unless the diamond industry fundamentally cleans up the way it operates. There won’t be any business worth inheriting for the next generation unless drastic changes take place. Launch a well-funded global generic promotional campaign for diamonds. Perceived value for diamonds has to be built up in consumers’ minds. Only if consumers value diamonds more and are willing to pay more for them will the entire pipeline see higher end prices for the product. While everyone pitches in to promote diamonds worldwide, the mining companies, who now have a collective platform in the DPA, should agree to an overall cutback in mine output. This might be seen as being contrary to the mining companies interests, but it is necessary for their long-term survival. With such a huge overhand of high-priced rough in the system, the pipeline is going to choke on itself very soon. Diamond manufacturers on their part have to cut back on how much rough they buy. They should process only as much rough as their client base will take. Everybody should focus on making profits from diamond processing alone and not divert their efforts to other sectors. 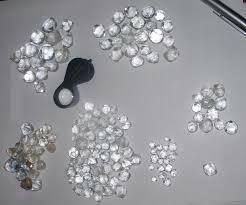 Diamond processing is solid industry that has been built up over decades through dedication and hard work. We shouldn’t let it all be eroded by a loss of focus and extraneous factors.